Competent writing begins with understanding basic sentence structure. It's true! Today, let's talk specifically about the POWER of the adjective. Learning the Shurley English Adjective Jingle during Jingle Time is the first step to leaning about adjectives! The basic information recited explains (1) what an adjective is, (2) what an adjective does, and (3) how to locate an adjective in a sentence. 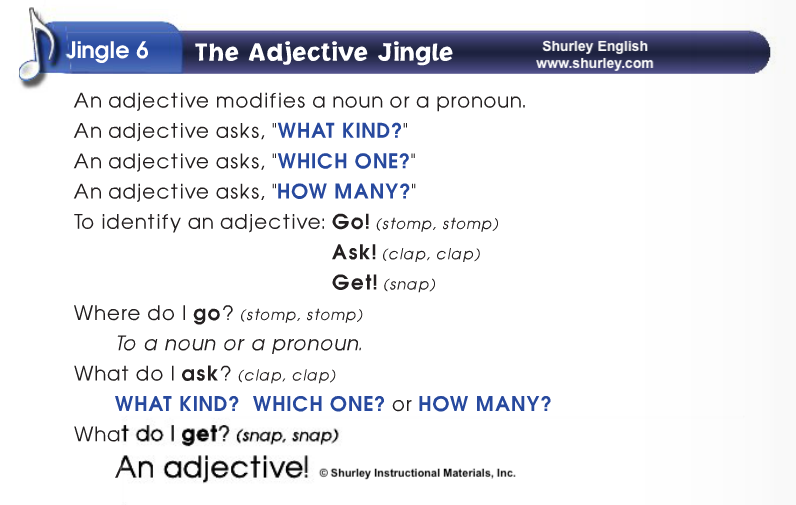 Reciting the Adjective Jingle regularly helps students easily remember the grammar concept. Once they grasp the basic understanding, they can begin to effectively and strategically apply adjectives when speaking and writing. There’s more to adjectives than the information provided in the jingle. You see, adjectives are a part of speech with POWER, and their job in the sentence is exclusive! Only an adjective can modify a noun or pronoun by telling what kind, which one, or how many. Only adjectives can be used to describe how something feels, looks, sounds, tastes, and acts! Besides common adjectives like short, last, and ten, there are five distinct categories of adjectives you should know: (A) article adjectives, (B) proper adjectives, (C) demonstrative adjectives, (D) interrogative adjectives, and (E) indefinite adjectives. 1. Article Adjectives: Only three commonly used adjectives are called article adjectives. They are a, an, and the. We use them on a daily basis when speaking and writing without giving them much thought. The article adjectives actually restrict the meanings of the nouns they modify. For instance, the article “the” is a definite article, meaning a specific person, place, or thing. A and an are indefinite articles, meaning one of several. Hint: Use the sound of the noun’s first letter to select a or an. -If the noun begins with a consonant, use the article adjective “a” before it. -If the noun begins with a vowel, use the article adjective “an” before it. Ask: Is the demonstrative adjective modifying a singular or plural noun? -Use the demonstrative adjectives “this or that” to modify a singular noun. -Use the demonstrative adjectives “these or those” to modify plural nouns. Use any category of adjectives with competence and confidence by learning about them and applying them when you’re speaking and writing. Before long, you’ll be effectively and strategically using them as you speak and write for all purposes!